Go wild with these animal riddles with answers! Why not add a touch of fluffy cuteness to your life, while simultaneously exercising your mind? These riddles about animals will do just that for you and those around you. 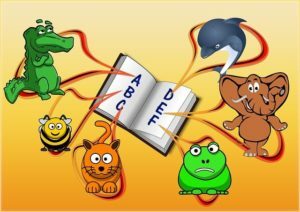 Share these with kids, animal lovers or anyone else who you think might appreciate and enjoy these fuzzy & funny animal riddles. The first section below is primarily more hard animal riddles for adults and those who enjoy a challenge, whereas the section after it contains animal riddles for kids. Enjoy and share! What kind of music do rabbits like? Why do cats make good soldiers? Buddy the dog was wearing a 2 foot leash. He sees a squirrel and wants nothing more than to chase after it. Lucky for him Buddy was finally able to catch the squirrel. How did he accomplish this? Why do turkeys get full on Thanksgiving? I have wings and I have a tail, across the sky is where I sail. Yet I have no eyes, ears or mouth, and I bob randomly from north to south. What am I? Hungry for knowledge? Check out our delicious food riddles. Or if you want an overdose of cuteness, check out our cute riddles. What did the turkey say to the rooster when he challenged him to a fight? Imagine this: A swarm of bees are going to attack you. You are running as fast as you can, running for your dear life. They are closing in about to sting. How can you escape from them? What did the leopard say after finishing his meal? Why do fish and reptiles always keep a trim physique? How did the worm call home? What animal has a cent? I can fly, I can walk and I can swim but I don’t get wet. What am I? What animal always has a buck? What do you call a bird that hates the winter months? What did the duck say at the end of his meal at the restaurant when the waiter brought him the check? I am a horse without legs and a body, I jump but never run. What kind of a horse am I? What animal is the best cricket player? Where do rabbits go to enjoy their breakfast, lunch and dinner? Why did the chicken, the pheasant, turkey, duck and goose get in trouble? It can be a bit hard to get kids to pay attention sometimes, but not when they are interested in the topic. And what child can resist animal riddles? The riddles here are somewhat easier than the ones above, but still will challenge the minds of young ones. Below you’ll find brain teasers such as what am I animal riddles, farm animal riddles and more. And for more, check out our riddles for kids. What kind of mouse do cats dislike eating? I can jump, I can swim, I swing from tree to tree and I make a house much bigger than myself. What am I? A chicken was given $7, an ant was given $21, a spider was given $28. How much money was the dog given? Mama bear asked Teddy bear why he wasn’t eating his dinner? What was his reply? What is the smartest insect? What do dogs, chocolate, and trees have in common? I have wings, I can fly, I‘m not a bird yet I soar through the sky. What am I? Check out our cool riddles for teens. Or our collection of turkey-roasted Thanksgiving riddles. A duck walked into a bar and watched a stand-up comedian. The duck couldn’t stop laughing, but managed to say one thing to the comedian between chuckles. What did the duck say? A sick bird walked into a hospital. What did it ask for from the doctor? How many berries does the skunk want to eat? What animal should you never trust? I have a cape but I’m not a superhero, I have a comb but never use it for my hair, and I am known to be quite territorial. What am I? I have the exact same size and shape as a hippopotamus but I weigh nothing. What am I? Kids love these who am I riddles! And if you’re looking for more animals such as black cats, spiders, ravens and bats, then check out our Halloween riddles. Where do hippopotamuses keep their money? Most of the time I am big, scary and hairy and can strike terror in those that I go after. Yet I have one form in which I am colorful, small and kids love to gobble me up. What am I? What animal is shy and always trying to hide from flying objects? Where do cheetahs, lions, jaguars, tigers, cats and pumas go for their school field trip? How do the fish, amphibians, reptiles, and birds stay healthy and fit? I hang in the sky, as birds pass me by, and I am always connected to the ground. I dance in the breeze and am made of trees, I soar without making a sound. What am I? →We hope you enjoyed these fuzzy, furry and funny animal riddles with answers! Feel free to share them with animal lovers and those who’ll enjoy them.